The train journey from Paris to southwestern France brings you through La Souterraine. The train stops just long enough to take this picture of the side of the railway yard through the tinted windowpane. The fun stripes on the gas cylinders bring a certain kind of French-style civic-minded Gemütlichkeit to the place. But the light-heartedness is tired, and lamely draws attention to what it is trying to disguise. Meanwhile in the foreground the yellow stripes on the railway track bring a much more stirring, industrial danger-zone feel to the place, which is more fitting. 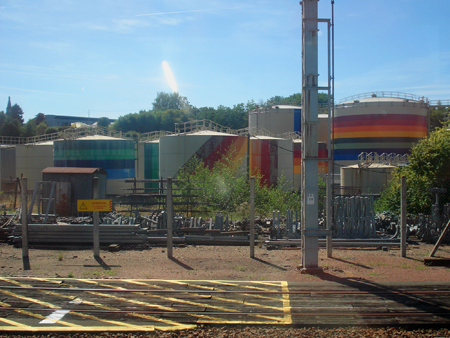 Looking back at the cylinders, the multicoloured stripes now seem, despite themselves, to warn of danger inside.